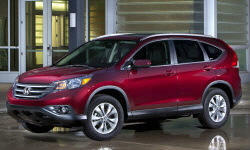 2013 Honda CR-V Pros and Cons: Why (Not) This Car? The 1996 Toyota RAV-4 might have been first, but the half-size-larger, more car-like 1997 Honda CR-V effectively launched the compact crossover segment. Sixteen years later, this segment has become huge and highly competitive. Though some contenders offer more style, more power, more features, or even all three, the CR-V continues to outsell them all. What is the secret of its continuing success? Traditional Honda, mostly for the better. Why the 2013 Honda CR-V? But the CR-V has been so consistently among the most reliable models in the survey that this must be a key factor in decisions to buy one. None of the 50+ owners of the fourth-generation CR-V participating in the survey reported even a single minor repair during 2012. This said, the Toyota RAV4 has been about equally reliable. The Mazda CX-5 has had a decent first year, while the latest Escape hasn't, but with both it's too early to infer how they'll fare in years to come. In pioneering the compact crossover segment with Toyota, Honda had no one to imitate--except conventional SUVs. Through three major redesigns (the most recent for the 2012 model year) the CR-V has retained a more truck-like, high and upright driving position than the CX-5 or Escape. Though the instrument panel isn't nearly as deep as in the Escape, it is deeper than those in the CX-5 and RAV4, and deeper than I personally prefer. But since the instrument panel is mounted relatively low, forward visibility remains excellent, much like in a minivan, only smaller. Smart move, Honda, since this is a primary reason people started buying minivans, then SUVs, and most recently crossovers. The view to the rear quarters isn't nearly so open. Because Honda doesn't want to fit the square rear with square rearmost side windows, the D-pillars are quite thick. To compensate, a rearview camera is standard even on the base trim CR-V. Thick rear pillars due to failed attempt to style a box. Simple, easy to use instruments and controls. Though a column-mounted shifter and a minivan-like walk through to the second row went away with the third-generation CR-V, Honda's compact crossover retains an interior that puts roominess and functionality ahead of sportiness. Thanks to an open design with a relatively compact instrument panel and center console, both rows feel even roomier than the class-leading (or close to it) specs suggest. Though the second-row seat is mounted too low to provide adults with much thigh support, the floor back there remains hump-free. Ignore the "& towing." Pulling a trailer isn't what the Honda CR-V is about. But the rear seat folds easily to form a low, nearly flat floor. Combine this with a tall, squared-off body, and you get nearly the largest cargo volume in the segment. (The redesigned Subaru Forester and Toyota RAV4 can each swallow a few more cubes.) With the shifter out of the way on the dash, the center console includes a very large storage compartment. The 2013 CR-V starts at $23,525, and even in EX-L AWD trim stickers under $30,000. This puts it about even with the already available 2014 Mazda CX-5 (which also has pricing among its "why to buys") and below other major competitors. A Ford Escape SEL AWD with leather and sunroof lists for $2,685 more before adjusting for feature differences (and for $870 more even after adjusting for these). In the comments, Azinck3 reminded me that the CR-V also holds its value incredibly well. So while the initial price is fairly low, the net cost is even lower. Why Not the 2013 Honda CR-V? The original CR-V was the most attractive. The second-generation crossover at least appeared functional. With the third-generation, Honda mixed things up. Personally, I kind of liked the hemispherical side window outline, but wasn't among the few fans of the bi-level grille. The latest CR-V has a more conventional (if weak-chinned) face but tires that don't nearly fill the wheel openings and a rump so out of proportion that even an out-sized tail lamp can't disguise it. To my eye, it's easily the least attractive CR-V to date. With such an emphasis on practicality, why can't Honda just give the CR-V simple, form-follows-function exterior styling more like that of the first two generations? Thankfully, the aesthetic misadventures don't continue inside the car. Unlike with the Civic, interior styling remains traditionally Honda. Controls and instruments remain simple, thoroughly conventional, and easy to use. When the CR-V first appeared, its handling seemed car-like. After all, with no direct competitors aside from the RAV4, conventional SUVs provided the reference point. However, compared to the latest Ford Escape, Mazda CX-5, Hyundai Tucson, and VW Tiguan, the Honda feels tall and clumsy. Its steering has some slack on-center and provides very little feedback. No one buys a CR-V to enjoy the driving experience. Yet ride quality is also average at best, with firm, somewhat noisy reactions to even small bumps and chuck holes. Cleaner grille than 2007-2011 CR-V.
Hump-free and roomy, but rear seat cushion a little low. Through the years the CR-V has enjoyed a number of power bumps. The only engine offered, a 2.4-liter four-cylinder, can provide up to 185 horsepower. But this peak power arrives at an ultra-high 7,000 rpm. The engine's peak torque (163 pound-feet at 4,300 rpm) is less impressive. Honda's latest 2.4-liter "Earth Dreams" engine, introduced in the new Accord, is no more powerful, but has a more accessible peak (6,400 rpm) and a stouter midrange (181 pound-feet at 3,900 rpm). Ford, Mazda (for 2014; much weaker 2013 rated here), and others offer stronger four-cylinder engines in their compact crossovers, and in some cases a performance-oriented turbocharged engine as well. But power is only part of the story. The real issues with the CR-V's powertrain involve noise and responsiveness. The engine buzzes when exercised and the five-speed automatic isn't responsive. With EPA ratings of 22 mpg city and 30 mpg highway (add one to each figure with front-wheel-drive), fuel economy is very good but not the best for a compact crossover. (The best is Mazda's CX-5.) Here as well some "Earth Dreams" would be welcome. Though certainly not noisy or crude, the CR-V has more engine, wind, and road noise and generally sounds and feels less refined than the average compact crossover. The GM sibs and Ford Escape lead in this area. One reason the CR-V's price tops out much lower than that of many competitors is that fewer features are available with it. Among other things, you can't get a fancy infotainment system, xenon headlamps, proximity key, or a vast array of collision alerts. If you want a gadget-filled compact crossover, Honda would prefer you buy the recently enlarged, V6-powered RDX (and even the Acura isn't available with as many features as the Ford). The 2013 Honda CR-V isn't beautiful, fun-to-drive, notably luxurious (even in leather-trimmed EX-L form), or available with the latest technology. But it is reliable, practical, economical, and reasonably priced. Judging from continuing strong sales, the second set of attributes must matter more than the first to many (even most) compact crossover buyers. If your priorities are different, though, you'll likely be happier with the Mazda CX-5 or Ford Escape. If, on the other hand, these are your priorities, then the Subaru Forester and Toyota RAV4 also deserve a look. Among the largest cargo areas in a compact crossover. Curtis Evans of Urse Honda in Bridgeport, WV, provided the car. Curtis can be reached at 304-629-4178. 2013 Honda CR-V pros and cons, according to Michael Karesh: the best reasons for buying (or not buying) the 2013 Honda CR-V. Join TrueDelta to post your own impressions. My mother in-law owns a 2014 CRV , I just took the car in to have the rear brakes replaced. Pads were completely worn down. The car only has 13000 miles. Had to beg the dealer to repace under warranty. All parts moved freely. This cant be the only one with early brake wear. No other problems than brakes. That is very early for rear pads. We do count brake pad replacements as repairs up to 24,000 miles, so if this is common it should show up in our reliability stats. See TrueDelta's information for all Honda models.